This will be my first Mother's day without my mom here and the second without Oma. I still want to say . . . Happy Mother's Day to the most wonderful, loving and giving women in my life. Thank you Oma for being a wonderful grandmother and giving me the most incredible mom a daughter could have . . . you both are missed so much . . . your memory lives in us each and everyday . . . 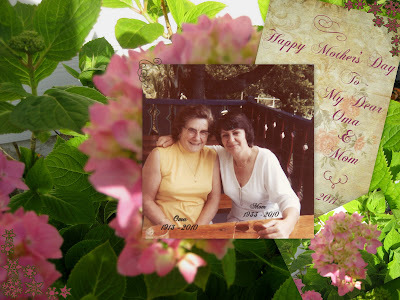 This same photo collage was created and posted for Mother's Day in 2010 > here < Dates have been changed for 2011.